SISA (The Swedish Information Systems Academy) is a national organisation for all Informatics departments in Sweden. This year Halmstad University chaired the annual conference on October 18-19, lead by the chair of SISA 2016/2017 Maria Åkesson. An important goal with SISA is to discuss the development of Informatics in Sweden. This year the SISA conference focused on (among other things) evaluation of PhD education, national collaboration around education, gender and equality integration in education and research, and the role of Informatics in the age of digitalization, to mention a few themes. Students from the bachelor programs Digital Design and Innovation and Enterprise Information Systems attended with posters. 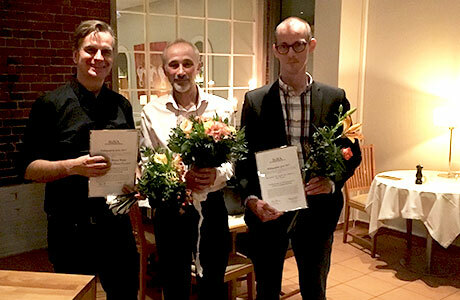 At the conference the winners of the Börje Langefors prize for the best dissertation in Informatics, and the prize for best pedagogical achievement were announced. Erik Perjons and Ilia Bider (prize winners), Stockholm University, and Jonas Sjöström (nominee), Uppsala University. (Not in the picture – Christina Keller, chair of the prize committee).